I’ve been running Windows 7 since the initial public betas (February 2009) and have loved it. One of my favorite features is the ability to drag an application to the left or right side of the monitor and have it snap to take up half the screen. Even better is using the Windows – Left Arrow and Windows – Right Arrow key combinations to dock the screens without using the mouse. This even works across multiple monitors. 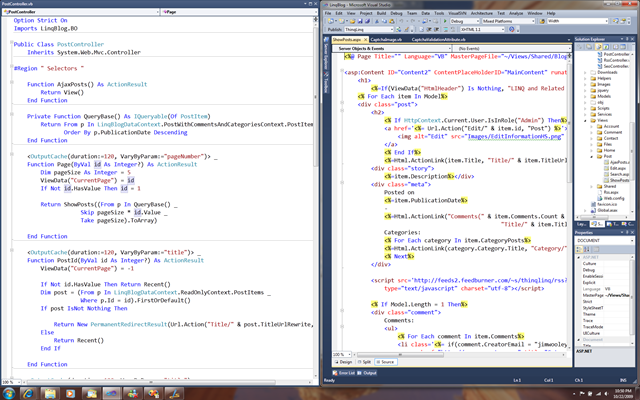 It’s a great addition for comparing documents, or in my case when translating code between C# and VB. By chance, I was playing with Visual Studio Beta 2 tonight when I slipped while dragging a code window. 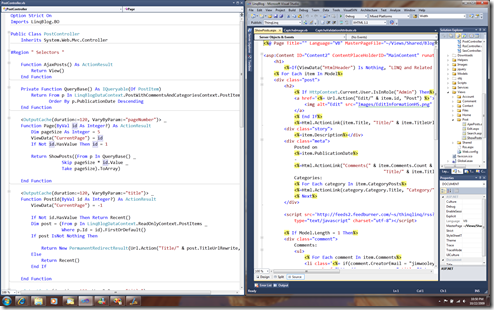 I intended to do a split screen inside of Visual Studio 2010. Instead, I drug the window outside of Visual Studio. To my surprise, the window moved correctly. Pressing my luck, I pressed Windows-Left Arrow and I was amazed that I now had half of the screen with the newly moved code window and the left half with the rest of visual studio. Here’s a sample screen shot demonstrating the result. In this case, the PostController from this site is in the left half and the ShowPosts view is on the right half. I loved that Win 7 docking supported separate apps, but had no idea that the docking would work with parts of the same app. I have a feeling I’ll be using this feature often! Have you discovered other Win 7 secrets with Visual Studio, I’d love to hear them.